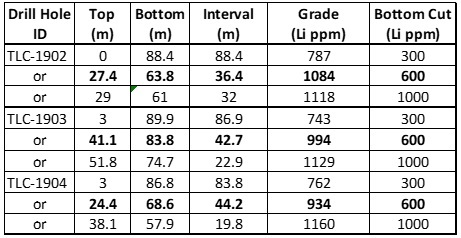 American Lithium Confirms TLC Project Discovery with Latest High-Grade Results - American Lithium Corp.
Vancouver, British Columbia–(Newsfile Corp. – April 3, 2019) – American Lithium Corp. (TSXV: LI) (OTCQB: LIACF) (FSE: 5LA) (“American Lithium” or the “Company”) a leading acquisition, exploration and development operator is extremely pleased to announce outstanding assay results from the latest three drill holes on it’s growing TLC lithium claystone project located just outside the mining centre of Tonopah, Nevada. The TLC claystone target is defined as a near-surface, relatively flat laying, free digging lithium target which is easily accessible by road and only 12 miles from the mining center of Tonopah, Nevada. It’s also just south of the Crescent Dunes Solar Energy Plant and source of the cheapest electricity in Nevada. Fourteen (14) additional drill targets are at varying stages of activity with another round of at least four (4) additional assay results due within the next two weeks. Additional results will aid in the determination of area-wide grade and thickness for project valuation purposes. Company management looks forward to providing further results as they become available. Drilling was conducted by Harris Exploration Drilling and Associates Inc., of Fallon, Nevada utilizing a “1500 Explorer” reverse circulation rig with a 5 Â½ diameter hole with face centred bit. Sampling was conducted using a riffle splitter or a cyclone splitter depending on the moisture content of the sampled material. Sampling was conducted over 5-foot (1.52m) intervals. Sample custody was maintained by the company’s consultants throughout the sampling and logging process. The company has a rigorous QA/QC program utilizing blanks, duplicates and a high and a low-grade lithium standard material. Duplicates and standard material are inserted into the sample stream on a 5% and 5% basis, and blank material was inserted into the sample stream. Samples were sent to American Assay Laboratories in Sparks Nevada for analysis utilizing the ICP-MS analysis protocol. Selected check assays samples were sent to the Bureau Veritas in Reno/Vancouver for analysis by ICP-MS.